brokenclay.org/journal > Life with a Disability > Accessibility > No E-bikes! Let them ride regular bikes like the rest of us. Open Space only for the fit and ambulatory, then? I recently found out about e bikes and was thrilled! I can no longer ride a regular bike more than 2 miles. I have been looking for the right pedal assisted bike with a throttle for emergency situations. (if my legs stop working even with the pedal assist). I want to ride public trails like everyone else and it would be the only way I could. Very sad to see the ignorant comment someone made. 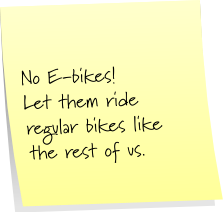 I would love to ride a regular bike like everyone else….if I could.